519. The number of students studying in the school during 1999 was? 520. For which year, the percentage rise/fall in the number of students who left the school compared to the previous year is maximum? 521. 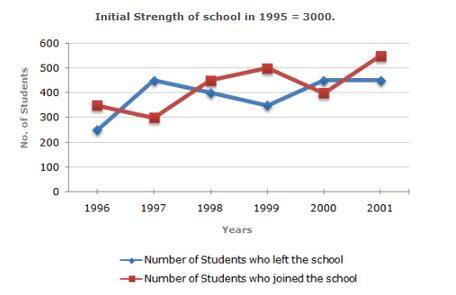 The strength of school incresed/decreased from 1997 to 1998 by approximately what percent? 522. The number of students studying in the school in 1998 was what percent of the number of students studying in the school in 2001? 523. The ratio of the least number of students who joined the school to the maximum number of students who left the school in any of the years during the given period is? 524. During which of the following pairs of years, the strength of the school was same? 525. Among the given years, the largest number of students joined the school in the year?